I have heard feedback that some of our readers come here looking for Cutlery themed artwork to decorate their kitchen or new restaurant. Finding flatware themed wall hanging art is a little difficult to find. So this week we are going to post about a couple of pieces that look pretty good to me. And here’s the second one. From Stupell the “Home Retro Look Fork Spoon Rectangle Kitchen Wall Plaque” has got a pretty long title for a pretty good priced piece of cutlery artwork. 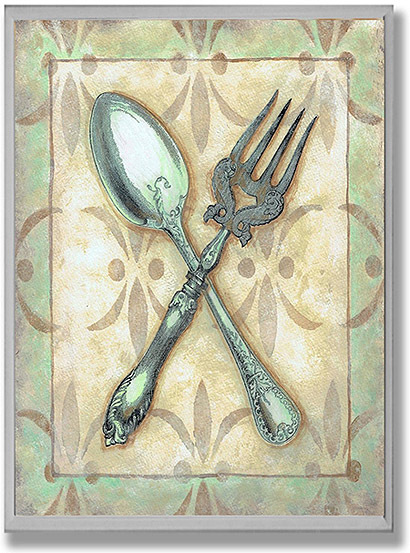 This fork and spoon is a high quality lithograph of sturdy half-inch thick MDF fiberboard. It is 15 x 11 inches in size and would be a perfect for a smaller kitchen or dining room.